There are some situations in common daily life when a person thinks about all those memories they spent with their loved ones. Some people believe in writing this down on some books so that they can relive that time and moment at any time of their life. In some psychological research, it is proved that writing something or anything with their hands can make them closer to their inner feeling which can help them strong enough to face unnatural elements of the world. 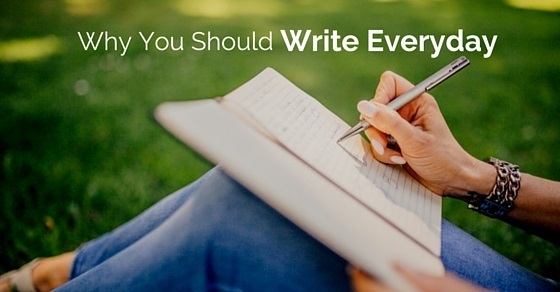 Following mentioned are few benefits and reasons that why you should write every day. If you have an idea about writing a book/novel or article. You should thoroughly focus on writing. Daily writing will help you to improve your vocabulary. Mostly beginners find it tough to write by hand, but slowly they will not feel lost in finding new words, they keep updating and find themselves improved in their writing skills. You also need to write every day, in a company written communication is considered as a formal communication. Written communication is the best way to inform employees of when hiring. Writing every day may improve your written skills. Importantly, the communication with superiors should be in a standard way. So writing daily improves your standards. Practicing daily makes your work faster, you can type and write in a smarter and better way. On the other hand, you can be an active member of your team. You can also make money out of writing. If you keep writing daily, you can work as a writer or a content writer. It gives you knowledge about new words and new content. You can also help your friends projects and articles. You can grab a lot more opportunities only when your format and diction is good. Nowadays in social media, films, music, study centers writing skills are required. So there are plenty chances to utilize. Writing by hand can create such an inner peace around oneself that a person starts feeling better by writing something about what he/she is experiencing at that moment. This kind of experiences improves some kind of connectivity within a person’s mind and soul. Therefore, it is always better to start writing by hand instead of clicking it on some digital devices. There is some kind of people who like to communicate less, but as a solution for that, they can start communicating their feelings by sharing or writing on a piece of paper. This kind of efforts can let him/her share their interests and thinking with others. Therefore, it is not necessary that a person should communicate with other verbally. In fact, he/she can communicate better through their writing skills. Writing by hand improves a person’s analytical skills. These analytical skills help a person improve his / her analyzing ability. These analyzing abilities create an environment for creative writing which brings some kind of soul into that particular article or book or novel. And ultimately brings a positive connection between mind and soul. Therefore, it is better to write by hand instead of using alternative sources. As mentioned earlier, writing by hand helps a person improve his / her creative intelligence. And writing on laptops can be considered as a writing which mobilizes the intelligence of that particular computer which is virtual. Therefore, writing by hand makes a person independent, instead of depending on an alternative source of technology. And finally, it creates analytical skill beneficial for the overall growth of the human mind. Firstly, your handwriting improves. For a good and great looking handwriting, keep practising daily this will help students to score well in their subjects. Good handwriting represents the nature of a person. Writing on a paper gives you creative thoughts, instead of typing. You can make your ideas on a paper and show it to the world as a creative element. This kind of efforts can be appreciated if a person starts writing on his / her own. For a student just reading the chapters and analyzing is little complicated. When they put on paper by writing by hand, this will make them memorize and will help them to improve their skills and it will be easy to by heart it. Start with letters daily, when you type this will not connect to what you study, only writing helps you to connect with what you study and write. These are the fundamentals to be taught to kids. Even when you grew old you will not forget your basics of writing by hand. Your creativity increases by writing by hand rather than typing something on a keyboard since it is a slow process. Writing by hand gives peace of mind. It makes you feel relaxed and put all your feelings on paper. When you have to submit a project. Your writing and presentation is the first and foremost thing considered. You put all your efforts and construct a project. If you failed in this presentation, then you may lead to score low. So handwriting skill is must and should. When you write an essay along with content, your handwriting is considered. Choose a good pen and put your creative thoughts on paper and share your ideas. To end this discussion, we would suggest everyone to start writing by hand because it helps the overall development of the human mind. There are some of the benefits of writing by hand and they are such as companies signature proof of an employee which is the ID of an employee. So handwriting also plays a key role. If your handwriting in a bank check or draft does not match it will be bounced, so here also handwriting plays a key role. If you print something and study one may not remember well but if you write and study that memory stands forever. Therefore, whenever a person thinks of writing something instead of writing on a laptop or computer, one can use their hands to share their feeling on a piece of paper.